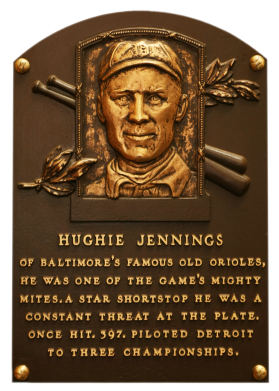 From 1894 to 1896 as shortstop and captain of NL Baltimore, Jennings led the club to pennants. In his five years with Baltimore, "Hustling Hughie" never hit below .328 and was a lifetime .312 hitter. 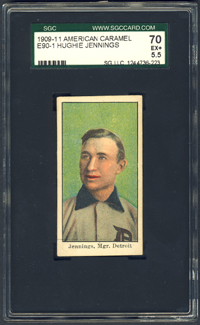 In his first three years as Detroit's manager, Jennings won pennants, from 1907 to 1909. He won 1,163-984 as manager. Comments: In May of 2000, I purchased a group of 1960 Fleer PSA 8s from Vintage Sports Investments via their website - G. Alexander, H. Heilmann, H. Jennings, H. Newhouser, W. Hoyt and E. Collins. They were temporary placeholders until I found a contemporary portrait card issued during their careers. In June, 2004 I won a PSA 5 T206 from Full Count Baseball Card Co. on eBay. It upgraded the PSA 3 example I had owned since January, 2003. I don't recall the back on either. I then upgraded to a PSA 6 T206 from J.J. Teaparty Sports Cards in August, 2005. Later, I swapped the T206 card out with a PSA 3 E90-1 American Caramel in December, 2005. This was upgraded to a SGC 50 in April, 2006 with an eBay win from Rock Bottom Sports. A major auction house win provided me with the example I own now, a SGC 70 picked up in May, 2011. 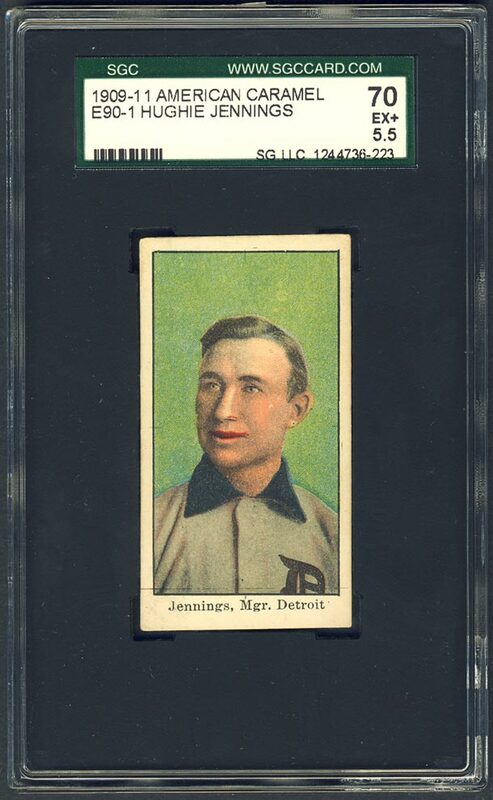 UPDATE: In May, 2014 a PSA 6 exampled showed up on eBay from Probstein. On the last day of bidding the card was hovering around $600. Amazingly, the card jumped to $1000 and I dropped out. I was into my SGC 70 for almost half that price. Later on in the evening when I went to look at the final hammer price I was shocked to see the card sold for$2000+ - unbelievable. I guess I won't be "bumping" my 5.5 anytime soon. 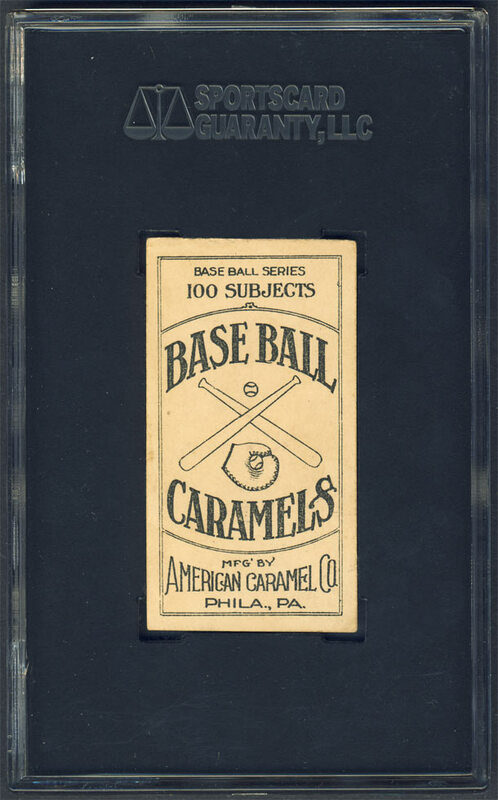 Description: The E90-1 set was issued by the American Caramel Co. from 1909 through 1911, with the bulk of the set being produced in the first year. 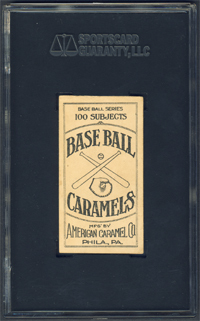 The cards, which measure 1-1/2" X 2-3/4" in size and were issued with sticks of caramel candy, are color reproductions of actual photographs. The card backs state that 100 subjects are included in the set though more actually do exist. There are several levels of scarcity in the set, those levels being mostly determined by the year the cards were issued. Mitchell (Cincinnati), Clarke (Pittsburgh), Graham, and Sweeney (Boston) are the most difficult cards in the set to obtain.